Periodontal treatment services (gum disease prevention) is provided by our Grande Prairie general dentists. 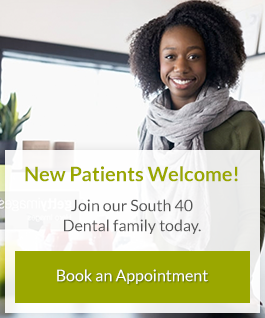 At South 40 Dental, we offer preventive services, diagnosis and treatment, all which affect the health of gums and jawbone. Periodontal (Gum) disease is typically associated with bad breath and swollen/bleeding gum symptoms, but did you know that it starts off as plaque? This buildup of bacteria is what leads to the gum inflammation and in most cases, bleeding gums when brushing and flossing your teeth. Gingivitis can lead to periodontitis, where the inner layer of the gum and bone pull away from the teeth and form ‘pockets’ between the teeth and gums. These pockets collect food and debris and can become infected. As the plaque spreads and grows below the gum line, your entire immune system is weakened. The disease may not show symptoms and can go undetected until more gum tissue and bone loss (recession) occurs, resulting in tooth loss. We have many options to help reduce and prevent periodontal disease. We also offer Laser Assisted Periodontal Therapy (LAPT) which is used for patients with moderate to advanced periodontal disease. This treatment is used to help stabilize bone loss and help build back tissue that was lost through the disease process. Think you may need treatment for gum disease? Book an appointment with one of our dentists today.